Beautiful, peaceful lakefront cottage in the center of New England. Our home has everything you need for your waterfront retreat. Enjoy morning coffee or go fishing on your private dock. Step out the front door and you are at the community park and playground. Walk 2 minutes to the community beach or 5 minutes to the start of 7 miles of hiking trails. Golf is less than 5 minutes' drive and skiing is 25 minutes away. Breathtaking fall foliage, and snowmobiling and ice fishing in winter. This is a brand new listing but we have tried to think of everything you would need to make your stay enjoyable. The lake is a hidden gem. It is is so peaceful and quiet. The first thing that will catch your eye is the the private floating dock. 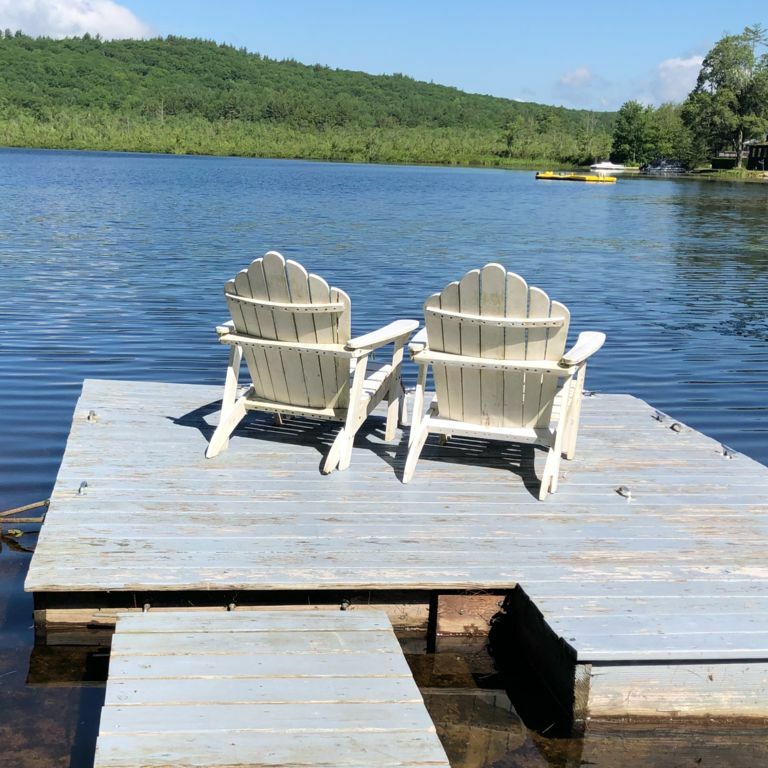 It has two Adirondack chairs to sit and soak in the amazing sounds and views or cast your fishing pole as the lake is stocked with several varieties of fish. The yard is large and flat. There are two decks with plenty of seating and a propane grill. On the grass there is more seating, a swing and a fire pit. The space inside is bright, open and airy with plenty of space to unwind and relax. All the rooms have ceiling fans and we provide stand alone fans as well. During the summer months the MB has air conditioning. For the cooler months there is central heating as well as an electric fireplace insert for ambiance and extra warmth. Fiber optic high speed Wifi is available, and both Netflix and Amazon Prime are on both flatscreen televisions (no cable). We also have a Bose sound dock and Echo Dot for your use. The newly renovated kitchen is stocked full with everything you may need from a Keurig for your morning breakfast to a blender for evening cocktails. It also includes a dishwasher so you don't have to do dishes on vacation:-) Help yourself to the coffee, tea, spices and condiments in the fridge. The master bedroom is quite spacious and has a queen bed, flat screen, desk and plenty of storage. The second bedroom has two twin beds so perfect for kids and teens. The bonus family room has a leather couch as well as a futon. It also includes a flat screen, Blu-Ray player, DVDs, board games and some toys and puzzles. The entry foyer has a cozy reading area and a bookcase stocked with books for children and adults. In the closet here you will find a Pack and Play and a high chair if traveling with a little one. The bathroom is modest but has all you need, including a tub. The vanity has a hair dryer and a basket of toiletries in case you forget to pack something. Towels are provided. We also provide all the linens and blankets for the beds and futon. Should you need to do laundry during your stay there is a utility room with a washer and dryer, and here is where you will find the iron and ironing board as well. Our vision for this property is a perfect couples' retreat or single family vacation. Our no party rule is a strict one. Please be respectful of our neighbors and their property. The maximum capacity of the home is 6 and and unregistered guests are not allowed in the property. There are many year-round residents on the lake so please respect quiet hours at 10pm. While we are pet lovers ourselves, pets are not allowed under any circumstance to continue to keep the space allergy free. This is our home and we spend as much time here with our children as possible. The home is very clean with many personal touches so please be mindful of that and leave the home in the same condition you found it. Air conditioning in the master bedroom during summer months. All rooms have a ceiling fan and we also provide stand up fans as well. The home is heated and there is an Electric insert in the fireplace for warmth and ambiance. All the beds have linens and there are spares in the linen closet as well. The living room has a loveseat and two chairs that recline. The bonus family room has a full size leather couch and a futon. Help yourself to any of the condiments in the fridge. We provide a Keurig and complimentary pods, tea, hot chocolate, spices and condiments in the fridge. Kitchen is stocked with everything we could possibly think of to cook and serve your meals. There is a flat screen in the family room and master with Netflix and Amazon streaming. The family room also has a blue ray player and selection of movies. There are books in the bookcases in the entry room and master bedroom. Paddle Boat provided. You must sign waiver and wear a life jacket to use (also provided). You are also welcome to bring your own boat as there is a boat launch. My hosts were extremely responsive and helpful with all requests. Their home was beautiful and cozy, even when temps were well under 0. They really did think of everything for their guests. The house was perfect for the two of us, and would also be perfect for a family of four (twin beds/bedroom looked cute)! Sunny, clean and inviting. Would love to return for a longer stay and enjoy reading a book in the sun room, a peddle boat outing on the pond, and just soak up the peace & beauty of the area. Wish my granddaughters were here - they'd love it too. A special thank you for those big, soft towels in the bathroom!